The Pitch: Sins of the fathers. The Review: If they ever come to update the Chinese zodiac, then 2011 might need to be revised from rabbit. With Drive, Crazy, Stupid, Love, The Ides Of March and (for UK audiences) Blue Valentine, 2011 was undoubtedly the Year Of The Gosling. Having made a moderate name for himself with earlier character pieces such as Half Nelson and Lars And The Real Girl, Gosling seared himself indelibly into the minds of film loving audiences with a year of high quality roles. 2013 sees him reunite with the directors of two of those works, Nicolas Winding Refn later this year and firstly Derek Cianfrance. Where Blue Valentine, Cianfrance’s previous collaboration with Gosling, was an almost claustrophobically intense two hander on the demise of a relationship, Pines sees Cianfrance set his sights more broadly, with a significantly wider range of characters and a much wider narrative scope. But the key differentiator to Gosling’s back catalogue is the introduction of another heartthrob alpha male in the finely chiselled shape of Bradley Cooper. This isn’t a Scorcese or Mann style story of crime and families; while both relationships and criminal activity make a strong showing, the good and the bad interact in vastly different ways. The story of Gosling’s Luke is the initial focus, as his career as a motorcycle stunt rider for a local sideshow barely pays the bills. When he discovers he’s fathered a child by ex-girlfriend Romina (Eva Mendes), his attempts to provide a stable financial future lead him to mechanic Robin (Ben Mendelsohn) as the two pull off some audacious bank robberies using Luke’s exceptional riding skills. Inevitably, their activities attract the attention of police officer Avery (Cooper), but his run-in with Luke creates its own set of problems. Romina finds herself being drawn into Avery’s world as well, and the two sets of lives become increasingly linked as time passes. Once again, his collaboration with Cianfrance serves to extract another top-draw performance from Gosling, who’s got the smouldering thing absolutely nailed, but manages to find another variation on his Drive persona with a more flawed, fractured individual whose violent outbursts are significantly less controlled and productive than his scorpion jacket-wearing counterpart. The real revelation is Cooper, who after becoming stuck somewhat in a rut of big budget but empty comedies and action movies builds on the good work he put in for Silver Linings Playbook, allowing real shading in what could have been a simple role. There’s complex characters across the board, and as well as Cooper and Gosling Mendelsohn and Mendes also shine, and the supporting roles are also well filled by Ray Liotta, Harris Yulin and especially Dane De Haan as a more troubled youngster. That Cianfrance works so well with actors should come as no surprise, but his compositional skills also step up a level from Blue Valentine and from a magnificent establishing shot of Gosling walking through the park to ride his bike into the show, to almost any scene where Luke’s on the run on his bike, the first hour or so crackles with bursts of kinetic energy between the character moments. It’s a shame that what comes later feels just a shade anticlimactic by comparison. Pines is episodic almost to the point of portmanteau, setting up three distinct chapters where characters take on vastly different perspectives in relation to the respective leads and with stories told in subtly different styles. The big problem is in the final chapter: as soon as the title card comes up for it there’s an inevitability to where the story’s headed, but it takes the two leads at that point so long to join the dots to what the audience already knows it verges on the painful, and by the time it has the narrative resolution of the thread that links the episodes is almost an “oh, is that it?” moment. You almost wish that Cianfrance and fellow scripters Ben Coccio and Darius Marder had avoided the attempt at the epic, sweeping scope and kept their focus tight on Gosling and Cooper, possibly even on just one or the other, as the first act had the makings of a classic but the whole isn’t quite the sum of its parts. It’s rare to see a film that clocks in at two hours and twenty minutes that you feel could have benefited from being longer, but another twenty minutes could have given Pines the room it needed to breathe and develop with the scope it set its sights on. But, once again, it’s most likely Gosling’s performance that will live longest in the memory. Why see it at the cinema: The tight first hour alone is worth making the trip out for, especially any scene where Gosling is tearing it up on his bike. What about the rating: Rated 15 for strong language, violence and drug use. There’s a lot of the first and a bit of the other two, and this would have been hacked to death to get anything lower. My cinema experience: A sparse crowd, somewhat understandably as this was a Saturday morning show at Cambridge Cineworld. No noticeable issues with projection, sound or audience. The Corridor Of Uncertainty: The captive Saturday morning audience were treated to an extended roster of trailers, including one for the Event Cinema Association for events which have all happened already. That resulted in a gap of 29 minutes before the film started, not ideal for a film running to 141 minutes itself. 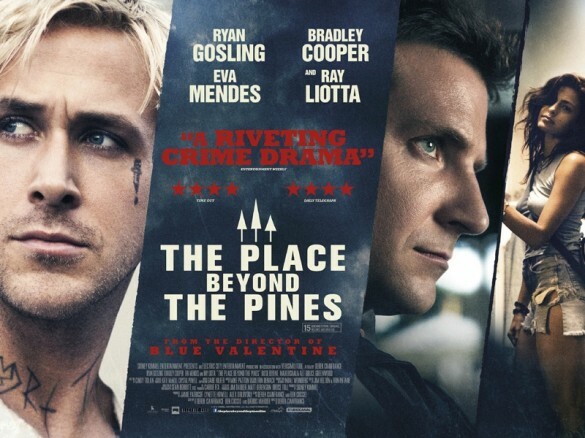 This entry was posted in Reviews and tagged 2013, Bradley Cooper, Derek Cianfrance, Eva Mendes, film, movies, review, Ryan Gosling, The Place Beyond The Pines. An Open Letter To The Competition Commission: Don’t You Mess With My Cinemas!